I grew up attending Union Christian Church in central Oconee County. 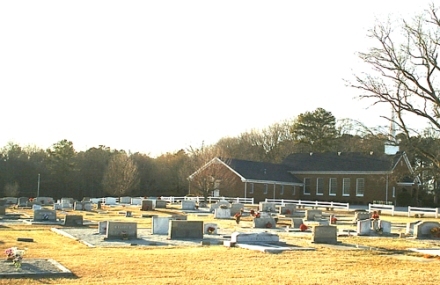 Many of my “Dawson” relatives attended the church and over time were buried there. My earliest recollections of the church building was in the Winter and seeing Bud Shelnutt put coal in the pot-bellied stove and having Martha Mathews (Lord) as my first Sunday School teacher while I was under school age. I remember Martha as being pretty and as a nice lady. I remember sitting in the Church and hearing a lot of singing of “Old Favorite Hymns”. Some were Power in the Blood, The Old Rugged Cross, Leaning on the Everlasting Arms, In the Garden and many more. I can picture in my mind’s eye the congregation singing “When the Roll is Called Up Yonder” with A. P. Dickens, Bud Shelnutt and Angie Bell Dickens singing loudest of all. I like to hear these songs today and often think of that time long ago when this music was such a joyous sound. 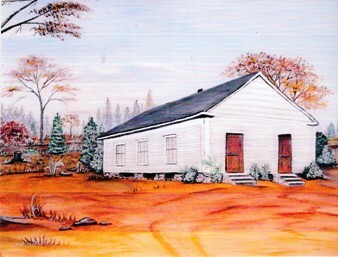 In 1948-49, the old frame church was replaced with a brick church. The Church Officers had purchased a Chapel from a military base. It was disassembled and the lumber etc was moved to its current site where it was reconstructed under the supervision of Mr. Will Parsons. While the “Basement” and Fellowship Area” has been added to and modified and a steeple was added many years ago, the main church looks much like it did in my youth of 50 years ago. I can remember military funerals for a Turnbull boy and Vance Daniell who died in World War II. I remember the guns and flag and a crowd of folks. In August of 1947, the Dawson Family and many friends gathered for the saddest funeral of my life. Edd Dawson, twin of Ned Dawson, died of Lockjaw (tetanus) that summer after scratching his foot on a nail and playing in the pasture around a cow barn. Edd was an outgoing person who was bright and very talkative. He and Ned were three years older than I but we played together regularly. Our families visited often in our early years and we frequently played under the shade trees in Uncle Raymond and Aunt Pat’s front yard on Burr Harris Road. Edd’s death hit us all very hard- his mother probably never really recovered from it. I can remember the morning that Mama told us he had died. Death was somewhat of a mystery to a six year old but I remember the open casket at the home on Burr Harris Road and how sad everybody was. It had been a sudden illness and Edd died around the third day. The death, funeral and aftermath made a lifetime impression. Dawson, Edd, 1937, 1947, plot 133. The first Sunday in August was Homecoming and revival followed the next week. Many evangelists held revival at Union during my youth. The meetings drew large crowds (using funeral fans) and many young people would join the church. I joined Union one year while Reverend E. N. Anthony was holding revival. He baptized me that summer. 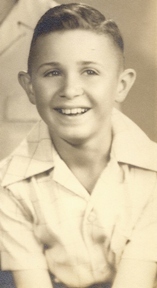 Wendell Dawson, April, 1952, Sixth Grade Picture. I was about 10 when I was baptized ca 1950. Rev. El Anthony was the epitome of a minister to me. He was slightly rotund with a large head. He had bushy hair and long bushy eyebrows. His voice, to me, was melodious, solemn and soothing- just the picture of what I thought a real preacher should look and sound like. Rev Anthony (Mr. El) also officiated at the funeral of my grandparents: Daddy Cliff Dawson died in May 1949 and Mama Hassie in March of 1955. Both funerals were at Union and they were buried in the cemetery. There were a number of young people attending the Union Church of my youth. Several of them joined me in entering the first grade at Watkinsville School in the Summer of 1946: Harry Thomas; Mack Caldwell, Ann Hill, Louise Dickens. David Vaughn and Donald Whitehead went to Union but attended Bogart School until we were consolidated as the first junior class of Oconee County High School in 1956. Many others near our age, Alton Butler, Ronnie Thomas, Neal Lord, Ned Dawson, all became lifetime friends because of our bonding at Union Church. We were participants at Christian Endeavor meetings in my childhood and later in Christian Youth Fellowship (CYF) as teenagers. We played Volley Ball and had Homemade Ice Cream Socials. In those days, there were more Christian Churches (Disciples of Christ) than any other in Oconee County. Most communities had one: Antioch, Bishop, High Shoals, Watkinsville, Union, Hebron and Bogart. Many of us attended conferences and visited the respective churches. In the days before Television and Interstate Highways, much of our social and cultural life centered on the church. Union and its members were active in all of these activities. The Union Church Barbecue, usually held in the Spring of the year, was a tradition that started before I was born. The Barbecue was sought out by hundreds of people who would come every year and eat. Many, especially in later years, came for ‘take-out’. 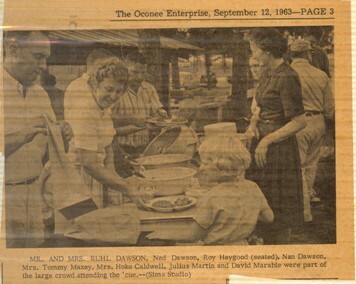 Politicians, particularly during election years, regularly attended the Barbecue. I remember eating barbecue and “politicking” in my first campaign for Commissioner in 1972. Most adult members of the church were active in preparing and ‘putting on’ the barbecue. 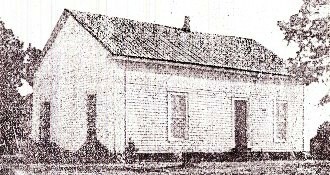 Union Christian Church was formed in 1852 by the "union" of two young congregations that were meeting in the area. The original building, a one-room structure, was completed in 1853 and was used continuously until 1948. Our current church building was an Army Chapel in Florida. It was moved to our present site and dedicated on January 16, 1949. 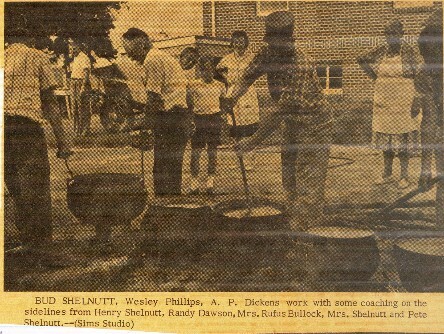 In 1975, a new educational wing and fellowship hall were added. The focus of Disciples of Christ worship is the Lord's Supper which is celebrated every Lord's Day. Sunday morning services consist of Sunday school and a traditional worship service which includes a children's sermon, children's church and youth programs for all ages. We also offer Wednesday evening Bible study. Many programs exist that complement our services - adult choir, children's music, and a handbell choir. Additionally, all age groups have activities which give opportunities to socialize, honor the Lord, and witness in the community. 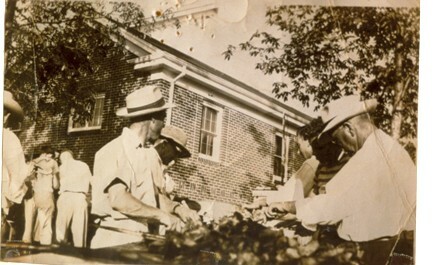 In 1937, Union Christian Church began its well-known annual Spring Barbecue.The Barbecue involves much hard work and cooperation of the entire congregation. Proceeds are used for outreach and lending a "helping hand" when disaster or misfortune strikes near or far as well as assisting the church in all its needs. Although, we are proud of our heritage, our doors and hearts are open to everyone. We live in a growing area and are so proud to have new families in our congregation who offer fresh ideas and insights to our existing structure. Please come and join us in fellowship and praises to the Lord.